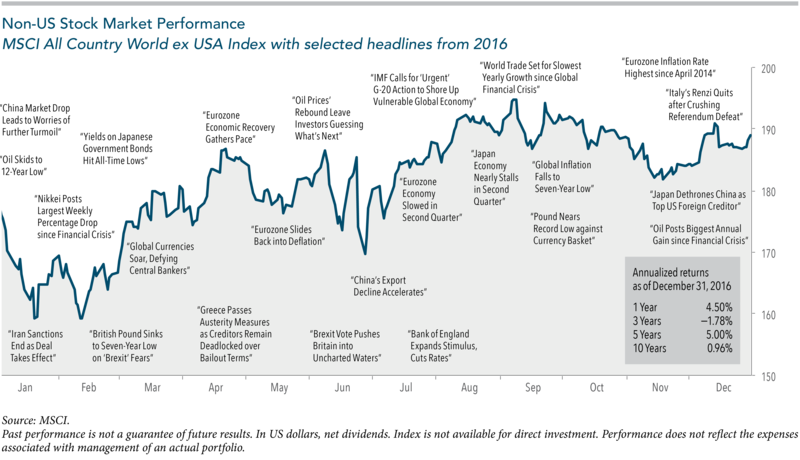 In 2016, the US market reached new highs and stocks in a majority of developed and emerging market countries delivered positive returns. The year began with anxiety over China’s stock market and economy, falling oil prices, a potential US recession, and negative interest rates in Japan. US equity markets were in steep decline and had the worst start of any year on record. The markets began improving in mid-February through midyear. Investors also faced uncertainty from the Brexit vote in June and the US election in November. Consider that global markets are incredible information-processing machines that incorporate news and expectations into prices. Investors are well served by staying the course with an asset allocation that reflects their needs, risk preferences, and objectives. This can help investors weather uncertainty in all of its forms. The following quote by Eugene Fama describes this view. 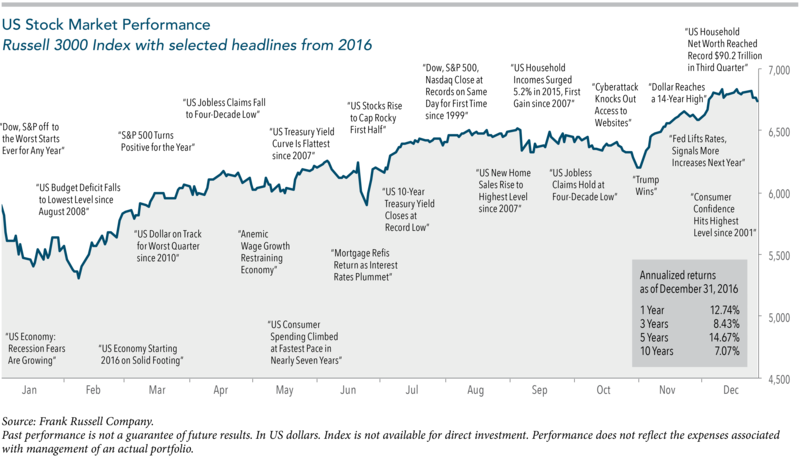 The chart above highlights some of the year’s prominent headlines in context of broad US market performance, measured by the Russell 3000 Index. These headlines are not offered to explain market returns. Instead, they serve as a reminder that investors should view daily events from a long-term perspective and avoid making investment decisions based solely on the news. The chart below offers a snapshot of non-US stock market performance (developed and emerging markets), measured by the MSCI All Country World ex USA Index (in USD, net dividends). The headlines should not be viewed as determinants of the market’s direction but as examples of events that may have tested investor discipline during the year. After a rocky start, the US stock market had a strong year. The S&P 500 Index logged an 11.96% total return and small cap stocks, as measured by the Russell 2000 Index, returned 21.31%. Overall, performance among non-US markets was also positive: The MSCI World ex USA Index, which reflects non-US developed markets, logged a 2.75% return and the MSCI Emerging Markets Index an 11.19% return. All non-US returns are in USD, net dividends. Overall, US equities outperformed equities in the developed ex US markets and emerging markets. As a result, a market cap-weighted global equity portfolio would have underperformed a US equity portfolio. Investors generally benefited from emphasizing value stocks around the world, as well as US small cap stocks. Returns at the country level were dispersed. In developed markets, returns ranged from –24.87% in Israel to +24.56% in Canada. In emerging markets, returns ranged from –12.13% in Greece to +66.24% in Brazil. Strong performance in the US placed it as the 17th best performing country out of the 46 countries in the MSCI All Country World Index (ACWI), which represents both developed and emerging markets. Although the S&P 500 Index had a positive return in 2016, the year was not in the top half of the index’s historical annual returns. Brazil offers a noteworthy example of market prices at work and the difficulty of trying to forecast and time markets. 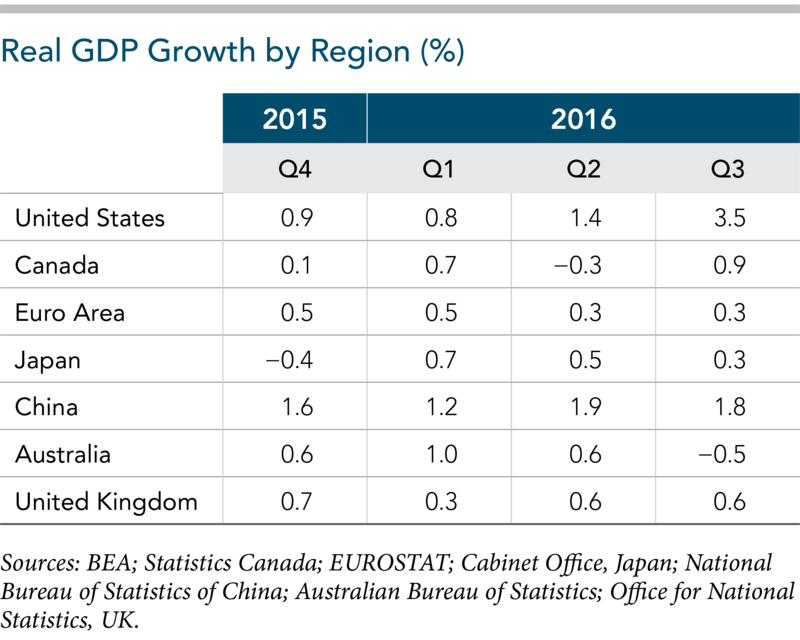 Despite a severe recession, Brazil was the top performing emerging market country in 2016. Brazil’s GDP was projected to shrink 3.4% in 2016, according to the OECD in November, yet its equity market logged strong performance. The lesson is that prices incorporate a rich set of information, including expectations about the future. One must beat the aggregate wisdom of market participants in order to identify mispricing. The evidence suggests that this is a very difficult task to do consistently. In 2016, equity market volatility, as measured by the CBOE Volatility Index (VIX), was below average. There were, however, several spikes—as you might expect—as new information was incorporated into prices. The high was reached in early February, and spikes occurred following the Brexit vote in June and again in November preceding the US election. In 2016, the small cap and value premiums were mostly positive across US, developed ex US, and emerging markets, while the profitability premium varied by market segment. Though 2016 marked a generally positive year, investors may still be wary following several years of underperformance for value and small cap stocks. 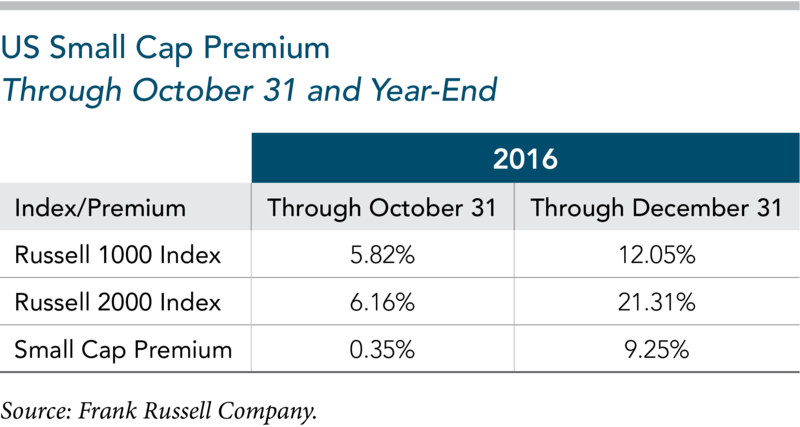 Taking a longer-term perspective, the premiums remain persistent over decades and around the globe despite recent years’ headwinds. The small cap and value premiums are well-grounded in financial economics and verified using market data spanning decades, but pursuing those premiums requires a consistent, long-term approach. In the US market, small cap stocks outperformed large cap stocks and value stocks outperformed growth stocks. High profitability stocks outperformed low profitability stocks in most market segments. Over 2016, the US small cap premium marked the seventh highest annual return difference since 1979 when measured by the Russell 2000 Index minus Russell 1000 Index. Most of the performance for small caps came in the last two months of the year, after the US election on November 8. This illustrates the difficulty of trying to time premiums and the benefit of maintaining consistent exposure. Through October, US small cap stocks had outpaced large company stocks for the year by only 0.35%. By year-end, the small cap premium had increased to 9.25%, as shown below. The VIX is a measure of implied volatility using S&P 500 option prices. Source: Bloomberg. The small cap premium is the return difference between small capitalization stocks and large capitalization stocks. The value premium is the return difference between stocks with low relative prices (value) and stocks with high relative prices (growth). Profitability is measured as a company’s operating income before depreciation and amortization minus interest expense scaled by book equity. The profitability premium is the return difference between stocks of companies with high profitability over those with low profitability. Profitability performance is measured as the top half of stocks based on profitability minus the bottom half in the Russell 3000 Index. US value stocks outperformed growth stocks by 11.01% following an extended period of underperformance. Over the five-year rolling period, the value premium, as measured by the Russell 3000 Value Index minus Russell 3000 Growth Index, moved from negative in 2015 to positive in 2016. In developed ex US markets, small cap stocks outperformed large cap stocks and value stocks outperformed growth stocks. Over both the five- and 10-year rolling periods, the small cap premium, measured as the MSCI World ex USA Small Cap Index minus the MSCI World ex USA Index, continued to be positive. The five- and 10-year rolling periods for the small cap premium have been positive for the better part of the past decade. Value stocks outperformed growth stocks by 9.26%, as measured by the MSCI World ex USA Value Index minus the MSCI World ex USA Growth Index. Similarly to US small caps, most of the outperformance occurred in the fourth quarter, reinforcing the importance of consistency in pursuing premiums. Despite a positive year, the value premium remains negative over the five- and 10-year rolling periods. In emerging markets, small cap stocks underperformed large cap stocks and value stocks outperformed growth stocks. Despite the underperformance of small cap stocks, small cap value stocks fared better than small cap growth stocks and performed similarly to large cap value stocks. Investors who emphasized small cap value stocks over small cap growth stocks benefited. Both US and non-US fixed income markets posted positive returns. The Bloomberg Barclays US Aggregate Bond Index gained 2.65%. The Bloomberg Barclays Global Aggregate Bond Index (hedged to USD) gained 3.95%. Yield curves were generally upwardly sloped in many developed markets, indicating positive expected term premiums. Indeed, realized term premiums were positive in the US and globally as longer-term maturities outperformed their shorter-term counterparts. Corporate bonds were the best performing sector, returning 6.11% in the US and 6.22% globally, as reflected in the Bloomberg Barclays Global Aggregate Bond Index (hedged to USD). Credit premiums were also positive in the US and globally as lower quality investment grade corporates outperformed their higher quality investment grade counterparts. While interest rates increased in the US, they generally decreased globally. Major markets such as Japan, Germany, and the United Kingdom all experienced decreases in interest rates. In fact, yields on Japanese and German government bonds with maturities as long as eight years finished the year in negative territory. In the US, interest rates increased the most on the short end of the yield curve and were relatively unchanged on the long end. The yield on the 3-month US Treasury bill increased 0.35% to end the year at 0.51%. The yield on the 2-year US Treasury note increased 0.14% to 1.20%. The yield on the 10-year US Treasury note closed at a record low of 1.37% in July yet increased 0.18% for the year to end at 2.45%. The yield on the 30-year US Treasury bond increased 0.05% to end the year at 3.06%. The British pound, euro, and Australian dollar declined relative to the US dollar, while the Canadian dollar and Japanese yen appreciated relative to the US dollar. The impact of regional currency differences on returns in the developed equity markets was minor in most cases. US investors in both developed and emerging markets generally benefited from exposure to certain currencies. Frank Russell Company is the source and owner of the trademarks, service marks, and copyrights related to the Russell Indexes. Dow Jones data provided by Dow Jones Indices. MSCI data © MSCI 2017, all rights reserved. S&P data provided by Standard & Poor’s Index Services Group. The BofA Merrill Lynch Indices are used with permission; © 2017 Merrill Lynch, Pierce, Fenner & Smith Inc.; all rights reserved. Bloomberg Barclays data provided by Bloomberg. Indices are not available for direct investment; their performance does not reflect the expenses associated with the management of an actual portfolio. Eugene Fama is a member of the Board of Directors for and provides consulting services to Dimensional Fund Advisors LP.